When you have old and outdated wallpaper, the best solution is to remove it! Wallpaper removal, however, is no easy task. It requires tedious work, patience, and a lot of experience to get the job completed in an efficient manner. Many homeowners try to take on this project not realizing what they're really getting themselves into. The whole process ends up becoming more complex and time consuming than it has to be. 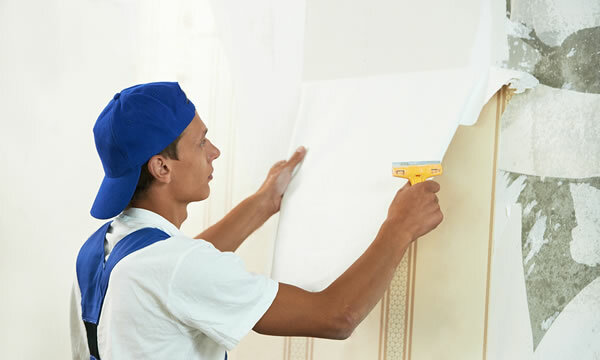 Instead of taking on too much, let our experienced wallpaper removal specialists in Maryland take on the job for you so you can worry about more important things. When we come to your property, we'll take the time to evaluate the job that needs to be accomplished. We'll then use steam and a proper solution to ensure minimal damage to your walls. We care about your satisfaction, and it matters to us that we do an excellent job for you. We're solely dedicated to making your life easier during this process, so we'll do whatever it takes to make sure you're completely satisfied. If there is anything at all that we can do to ensure we meet your needs, please don't hesitate to let us know. Deciding to change a previously wallpapered room into one with painted walls instead is a significant step, but we'll help make sure the process is as smooth as possible. We make every effort possible to ensure we adequately remove the wallpaper or wall covering before we begin the wall preparations. Our Maryland wallpaper removal services are more than just about removing wallpaper. We focus on the removal of wall covering, prepping walls for painting, and then we paint the walls using the skills and knowledge we've learned along the years. We take pride in our work, which is why we have customers that come back to us repeatedly. We don't just do things the way that we think is best. Instead, we listen to your needs and wants, and we perform services that match your specific preferences, because, after all, the job we're performing is for you! If you were to take on the job of removing the wallpaper yourself, it's quite possible you'd be stuck at the job for hours, and possibly even days if you had multiple rooms to do. Not all wallpaper is the same, and some of it is much harder to remove than others are. When someone without much experience in wallpaper removal attempts a job like this, there's a great possibility that the walls can sustain significant damage in the process. Not only will the task of removing the wallpaper take a lot of time, but it could end up costing you extra money in the end as well. When you call us, you're saving yourself a lot of unnecessary stress. You are also preventing yourself from wasting precious time and money. Our services are as professional as can be, and we make every effort to make sure you know you can trust us. We're reliable and dependable, and we'll always show up to the job when we say we will. We have the experience necessary to get all kinds of jobs done, and there has never been a job where we have not been able to remove the wallpaper. We're confident that you'll love our services. We'll never cut corners to get the job completed quickly. We take the time to complete every job correctly, and we'll never leave a job until you are completely satisfied with our work. We'll work closely with you during the entire process to make sure you're happy with the results of our services. Changing a room from wallpaper to paint is an excellent choice, one that can change the look and feel of the whole room. If the wallpaper was dark, old, and outdated, adding a fresh coat of paint to your room can brighten things up, making your space look like an entirely new area. Paint is a fun way to customize a room because it's easy to change the colors, matching the walls to your selection of interior design color choices. We can also provide you with assistance in choosing the perfect paint color for your room if you need help. With so many custom options to choose from, you'll have no trouble finding a color that best suits your personal preferences and your sense of style. Call us today for Maryland wallpaper removal services you can trust! We guarantee you'll love the professional and courteous services we'll always provide you with. Contact Us Today For A FREE Wallpaper Removal Estimate!